Every two weeks, Big Issues focuses on a newly released comic book of significance. This week, it is The Mighty Thor #706. Written by Jason Aaron (Avengers, Southern Bastards) with art by Russell Dauterman (Superbia, Cyclops) and colorist Matthew Wilson (The Wicked + The Divine, Paper Girls), this issue concludes Jane’s foster time as Thor and closes the door on a period of Marvel history defined by legacy characters. This review reveals major plot points. Jane Foster is marked for death the moment she picks up Thor’s hammer. She’s in the midst of a battle with breast cancer, and every time she transforms into the Asgardian god of thunder, her chemotherapy is magically wiped from her body, but the cancer remains. Eventually she will give up the Thor name, because that’s just how superhero comics work, and it has always been implied that her time as a superhero would end with her passing. Jane has been Thor since October 2014, and her ongoing solo adventures in Thor and The Mighty Thor are some of the best comics Marvel has put out in the last five years. 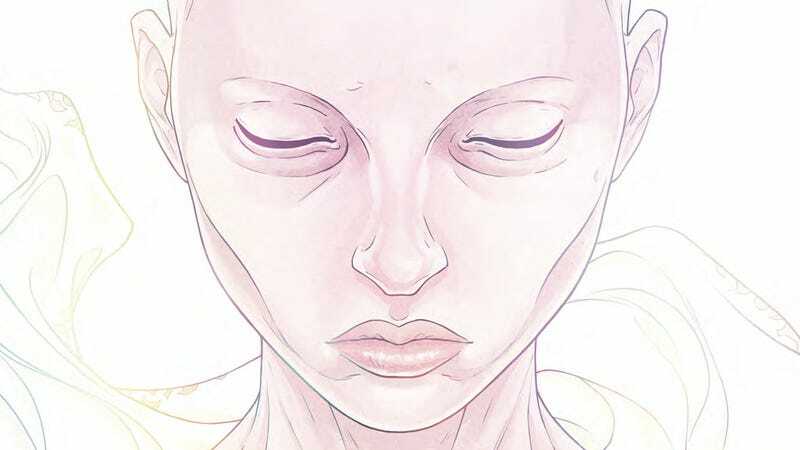 Writer Jason Aaron, artist Russell Dauterman, colorist Matthew Wilson, and letterer Joe Sabino have established Jane as a fundamental presence in the Marvel Universe, and even though her death has been inevitable since the start, it’s a waste to kill off a character after she’s received so much rich development. The inevitable has occurred at the start of The Mighty Thor #706, the final chapter of this team’s three-and-a-half-year journey. Jane has sacrificed herself to save the Asgardians from a god-killing monster, and with the death of her body, her soul stands before the entry to Valhalla, where she will live her afterlife in paradise. But Jane isn’t ready to die. This isn’t a book about someone who gives their life to be a hero. It’s about someone who does the heroic thing knowing that death is the most likely outcome, but she saves the day and survives. The stakes have risen astronomically high over the course of this series with the spreading of Jane’s cancer, the war of the realms, and the Mangog’s rampage, but superheroes are all about overcoming overwhelming odds, even if that means coming back from death. In real life, the dying don’t get to step back from the gates of Valhalla while their beefcake ex-boyfriend pumps their body full of magical pink lightning. But when death feels imminent, will you push through the suffering if there’s a chance of beating the disease? Some choose not to subject themselves to that pain, some seek treatment that doesn’t work, and some are able to beat back their sickness and prolong their lives. This creative team doesn’t want to end Jane’s story on a mournful note, and her harrowing road to survival has one last obstacle in a god-size medical emergency. Jane Foster made a superstar out of artist Russell Dauterman, who proved himself to be the total superhero package right out of the gate. He draws high-energy action, spectacular fantasy worlds, and characters with distinct looks and personalities, and he has an ideal collaborator in colorist Matthew Wilson, who matches the detail of the linework in his rendering while reinforcing the emotional content with his palette. Where Dauterman excels most is in his depiction of the titular hero, and his Thor always projects intensity and power, with body language that says she is ready to fight her way through any obstacle. Thor’s resilience is at odds with Jane’s fragility, but the realms need a Thor to protect them and Jane can’t shake her responsibility, even though it comes at great personal cost. Dauterman experiments with panel layouts and page design to evoke certain feelings, and for the first two-page spread of The Mighty Thor #706, the panels float across a cosmic background like tattered pieces of paper or fabric. The design implies destruction, and the panel borders will continue to transform as Odinson tries to resurrect Jane by harnessing the power of the God Tempest/Mother Storm that has been unleashed after the destruction of Thor’s hammer, Mjölnir. Those tattered panel borders become rippling waves of energy, and large “KRRZZT” sound effects contain images of Jane’s body being shot with bursts of lightning. By contrast, the panels depicting Jane and Odin at the gates of Valhalla have clean, unfussy layouts with smooth rectangular and circular panels that create an atmosphere of serenity. Valhalla is colored with the shades of ripe fruit in summer sun, and it’s a lusciously tempting future for Jane. But she resists. Something is holding her back, and the panels are shaken off their axis when her body is hit by the lightning. That visual chaos bleeds into this heavenly realm, but the rigid structure will return for a moment of clarity before resurrection, when Jane realizes that she doesn’t want Valhalla. She wants to continue writing her story, and she leaves Valhalla behind as the storm reignites her life force. The panel borders begin to straighten as her body awakens, and for the rest of the issue, Dauterman uses a governing circle layout to bring a gentle sense of harmony to the epilogue. The circle is also a visual callback to the gate of Valhalla, subtly suggesting that Jane is living in true paradise as she fights cancer and helps Asgard rebuild. Wilson uses lush natural greens to accentuate the idea of growth and healing, and the issue ends with a beautiful shot of Jane standing at the edge of Asgard while the spirit of her Thor soars above her, colored with warm shades while Jane stands on a wide plain of grass. This image emphasizes the smallness of Jane compared to her godly alter ego, a key element of that character dynamic throughout the run, but she’s no longer frail. She’s strong and confident, ready to take her next steps and grateful for the time she spent in the skies. While Odinson attempts resuscitation, Jane and Odin have the conversation that the entire series has been building up to, with Odin finally putting aside his pride and recognizing the greatness of the woman who challenged his authority. Jane has fought patriarchal tyranny and toxic masculinity for her entire stint as Thor, and it’s made this series unpopular with a certain section of the fanbase who doesn’t want superhero comics to shift away from their straight, white, male traditions. Aaron’s letter in the back of this final issue addresses the unprecedented rage directed his way because of Jane, but both he and Dauterman write about the immense outpouring of love they’ve received from readers whose lives have been affected by cancer. Even though she’s not going to be Thor for the foreseeable future, Jane’s legacy will live on for a long time as these stories are discovered by new readers, and the emotional resonance of this run proves how valuable it is to showcase characters with different experiences. This story could have potentially been told with Jane becoming a new Asgardian hero instead of replacing Thor, but the chances of that book surviving for this long with the same creative team are slim. Jane greatly benefited from the Thor name, and this high-profile change for the character meant that more eyes were on her from the very beginning. Legacy heroes rarely last forever, especially when the general public is familiar with one specific version of the character, but in the case of Jane Foster, the creative team was able to give her a lengthy run that made an indelible mark on Thor mythology. The recent Marvel Legacy initiative was sold as an attempt to tap into the spirit of the past, and that meant gradually phasing out the legacy characters that had come to prominence in the last four years. Sam Wilson is no longer Captain America and has returned to his Falcon title. Riri Williams and Victor Von Doom are stepping out of the spotlight as Tony Stark gets back into his Iron Man armor. Miles Morales’ ongoing series is ending with creator Brian Michael Bendis’ jump to DC (although he’ll likely be back by winter for the new animated movie Spider-Man: Into The Spider-Verse). The fate of Amadeus Cho’s Hulk is still a mystery, but he’s probably reverting back to his old non-Hulk self with the conclusion of his ongoing series, and Laura “Wolverine” Kinney is reclaiming her old X-23 codename for a new solo book debuting in July. Not all the legacy heroes are gone—Kamala Khan is about to celebrate her 50th Ms. Marvel issue, and Kate Bishop’s Hawkeye just scored an Eisner Award nomination for Best Continuing Series—but their superhero names don’t have the cultural cachet of Captain America, Iron Man, Spider-Man, and Wolverine. This wave of new characters stepping into Marvel’s most popular superhero roles began with the announcement of a female Thor on The View, followed shortly after by the announcement of Sam as Captain America on The Colbert Report, and there was major momentum behind the marketing for these changes. But things quickly got jumbled with the launch of Secret Wars, a crossover event that ended all of Marvel’s ongoing series, including the recently launched solo titles for Jane and Sam. Those series came back with new #1 issues after Secret Wars, but Sam quickly became the secondary Captain America with the return of Steve Rogers. Jane was able to stay in the spotlight for longer, but the conclusion of her Thor run feels like the endpoint for this legacy-heavy era, especially because Marvel’s new Fresh Start initiative begins the following week. Jason Aaron is the writer of Marvel’s first Fresh Start series, Avengers, which has Odinson back in the Thor role and reuniting with his old buddies Captain America and Iron Man. This week’s first issue is a by-the-numbers superhero team debut, setting up the different cast members before they’re brought together against one central threat. The emotional core of the story relies on the reader being invested in seeing the Avengers trinity back together, but there isn’t much justification for going back to the old guard other than this is how it must be. Translation: These are the most popular versions of these characters, so they should be back in action and working together. It’s still early, but the plot of this new Avengers is very basic. So basic that there’s another major superhero release this week with the same general concept and ending. In Avengers, a group of heroes is brought together because dead Celestials are raining from the sky, signaling the arrival of a bunch of different giant cosmic bad guys who are about to wreak havoc on Earth. Meanwhile, in DC Nation #0, the Justice League has broken into four smaller squads with characters from all across the DC Universe, fighting giant cosmic bad guys who have broken through the Source Wall and are about to wreak havoc on Earth. That Justice League story, written by Scott Snyder, James Tynion IV, Joshua Williamson, and Brian Michael Bendis with art by Jorge Jiménez and Alejandro Sanchez, takes a different approach, because it’s a teaser instead of the first chapter, showing readers of the 25-cent DC Nation one-shot what they can expect when the Justice League: No Justice miniseries reaches fever pitch. It’s concerned with big, cool moments—Superman throws Starro! The Atom rides a Batarang!—instead of setting the groundwork for why these characters are together like Avengers #1.